Comments Off on Hammertons First Pub!! 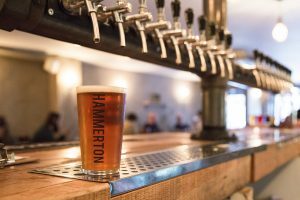 Due to the popularity of our monthly Brewery Taproom openings and requests to open up every weekend we decided it was the right time to open up a pub in our home town, where you can try the full range of Hammerton beers every day, including some exclusive one off brews. House of Hammerton is less than a mile from the brewery our pub serves as a great opportunity for us to be able to show people what we are about, to get to know our customers and to be able socialize with our community! Formerly known as the Black House in the 1970’s it is located on Holloway Road ‘The Heart of Islington’. The building itself was briefly the start of radical black Britain. Also bizarrely John Lennon and Yoko Ono stood on the roof of the pub swapping their cut hair with a pair of bloodied Muhammed Ali shorts, true story!! We have 20 keg lines and 4 cask lines that are all cared for by our brewery and cellar staff to ensure they are in the best possible condition. Due to our love of beer and the vast number of beer lines we are also able to sell some of our favourite beer from around the UK and the rest of the World. We also have a drink in or take home bottle shop with over 60 different beers to suit even the thirstiest of beer connoisseurs. If you get fed up of beer we also have a well curried list of spirits and wines to keep you happy.